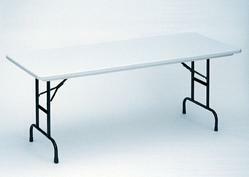 Correll Folding Tables - Heavy-Duty Standard Height Table. Model R3060 features a 30" x 60" Table top. Comes in Mocha Granite or Gray Granite colors. Shipping is included on this product anywhere in the 48 continental United States. Correll Blow-Molded Folding tables R-Series are suited for Heavy-Duty use. Unlike the CP-Series Correll Folding Tables, the R3060 functions wonderfully for typical use outside of the home or office. The R-Series tables have a "ladder" steel frame under the table top for added support. These tables are also water proof and stain resistant, making them ideal for uses where food or chemical exposure is likely. 30" x 60" Table Top. Standard table height: about 29 inches. 1", 18 gauge steel Pedestal Legs on Rectangular Tables. 1 1/8", 14 gauge steel Wishbone Legs on Round Tables. Light weight, waterproof, and virtually indestructible one piece Blow-Molded Plastic Top, resists damage even from Gasoline, Paint Remover, Battery Acid, and Drain Cleaner. Colors go all the way through, will not wear or scratch off. Mar-Proof Plastic Foot Caps & Automatic Lock-Open Mechanism. Table Weight: about 37 lbs. Quick-Ship table option: orders for these tables typically leave the warehouse within 1 to 3 business days. Transit time, once these tables leave the warehouse varies, but is usually between 3 to 5 business days in transit time. What is the difference between Correll Heavy-Duty Tables and Lifetime Tables? Correll Heavy-Duty Folding tables and Lifetime tables are made from the same material, i.e. blow-molded plastic table top, and a steel framework. The R-Series folding tables main difference from Lifetime tables is that the design is geared more towards Heavy-Duty functions; Lifetime tables are meant more for medium-duty jobs. If you would like to see a comparable Lifetime Table model to the R3060, please view our Lifetime 4534 Table or visit our Lifetime folding tables category page. 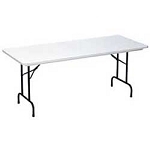 If you do not need Heavy or Medium-duty folding tables, we also carry a light-duty Correll folding table with the same measurements. Please note that the 4534 Lifetime Folding table is also a fold-in-half table, whereas the Correll R3060 is only a folding table and does not fold in half. Q: What is the width when the table is folded? A: It takes up about 2 1/2 inches of thickness when folded. Shipping on In Stock Items: Orders for the Correll R3060 generally leave the warehouse within 1-2 business days. Dimensions: 60" x 30" x 5"